This year, inspired by some of the great articles I’d read on the Creative Countryside journal, I made a new year’s resolution to make a serious effort to change my lifestyle. I was eager to embrace slow living, to get outside more and to reconnect with nature and the seasons. I was excited by the potential new exciting activities this would involve and top of my list was to go camping. I used to love camping, pre-kids, but since the arrival of our two small boys, it has felt rather less... feasible! But I knew we should definitely give it a go and spent much of the year psyching myself up to planning a trip. We finally managed it in September. Now if you’re living in the UK, you might remember – this September saw two glorious autumn weekends: beautiful golden light, soft breezes, rosy fruits in the hedgerows, a fresh tang to the morning air giving way to lots of warm, gentle sunshine. They were the kind of days where you just want to spend every moment outside, soaking up the last tastes of summer. Neither of those weekends were the ones we went camping. The weekend we chose was a little different. The weatherman predicted northerly winds and single figure night time temperatures and on the Friday evening, the rain lashed down as we headed for the Norfolk coast. “What are we doing? ?” I repeatedly asked my husband as double-rapid wipers struggled to clear the windscreen. Of course we’d planned the whole thing at the height of summer. “September is usually lovely” I assured one of the friends coming with us. “Better than August” he confirmed. I was so excited at the prospect of the trip – I was finally making good on my resolutions. When we reached our destination in Norfolk, the kids were inexplicably still awake despite their usual propensity to fall asleep in the car at the drop of a hat. “As long as we don’t have to put the tents up in the dark” asserted my husband but the last of the light had faded as we pulled into the campsite. Things weren’t going brilliantly. But – and there had to be a but – it had stopped raining finally and it was actually good fun getting the tents up with friends, even by torchlight. The children were shattered so they fell asleep almost immediately and by the time we emerged from our tent, the stars were out and all that was left to be done was to pop open the bottle of Prosecco our friends had kindly brought, wrap ourselves up in our warmest clothes and relax alfresco. The next days were filled with windswept beaches, actual pirates (a pirate festival in Wells! ), sand dunes and beach barbeques and we had a wonderful time. Pack all of the clothes: the sun was warm, the wind chilly, the rain showers heavy and the nights downright cold. I packed everything and we used the lot. Love the stars: no lesson here for countryside livers but I’ve abandoned my rural roots and now live in a small town – seeing the stars, satellites and milky way again without light pollution for the first time in a few years – beautiful. The more children, the more relaxing: other people’s children entertain your children so you don’t have to. Result. 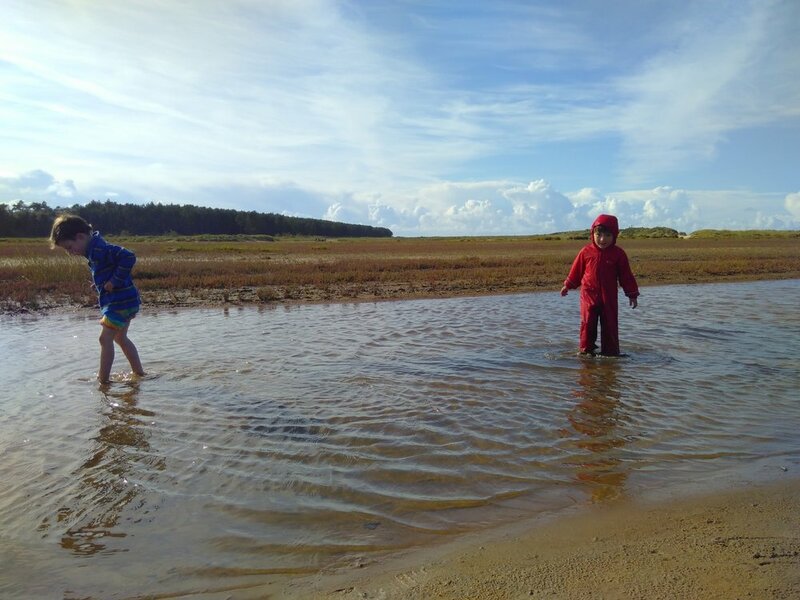 Sand dunes offer everything: castles and palaces, hide and seek and dens, exercise for little legs, shelter for big ones, shells and treasure – the delight on my two boys' faces during a few hours by the dunes at Holkham beach spoke for itself. 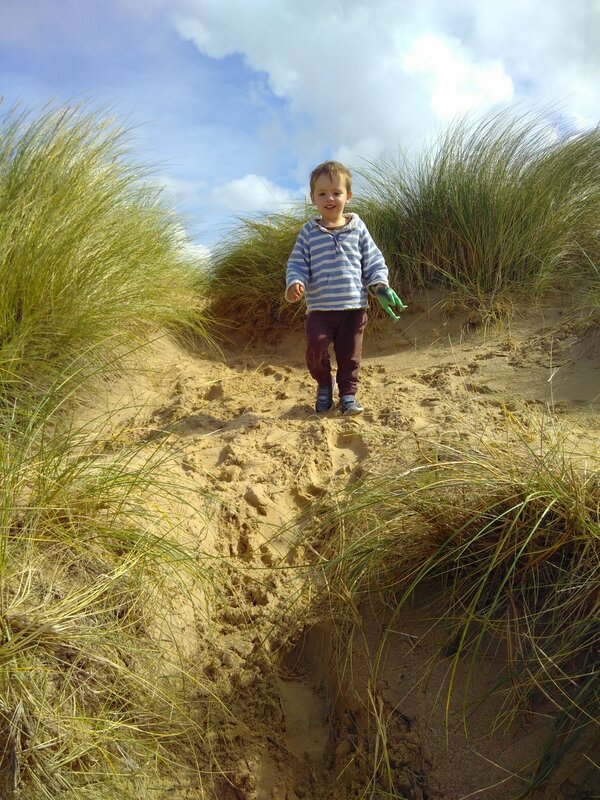 Beware of cuts from the spiky marram grass though! Sausages taste best on a beach barbeque, especially when it takes a while to get going and you’re properly hungry for them. Proper comfy air beds beat thermarests hands down: I have a tendency to be a bit purist when it comes to camping – is it really proper camping with mattresses and a duvet? A bit of me still thinks no but nevertheless, so much more comfortable. Don’t go all out on the first night. You know the drill – group gets together, excited at prospect of adult company, stays up chatting late into the Friday night, possibly with the odd drink, and the rest of the weekend suffers. I’ve done it so many times before (I swear the best conversations happen after midnight) but I learned, again, that it’s not the wisest move – the small people wake early in tents! Finally... It felt like real life, the kind of life I want to be living – my feet sinking into waterlogged sand, the waves soaking my jeans, the crack of the pirates’ muskets, the kids' laughter outside the tent, even at 6.30am, relaxed chats with good friends who aren’t in a hurry. Autumn camping? Yep, I’m there!